All beginner guitarists struggle with switching between chords at first, thats part of the learning curve. Here are some tips on the subject, but make sure you watch our video lesson on how to change between guitar chords, where I will show you the correct technique of learning chord changes. Watch my hands closely to see the correct method. The main reason beginner guitarists experience difficulties when switching between chords quickly doesn't really have that much to do with their fingers. The main problem is that beginners haven't learned to visualize which chord they're about to play, and which fingers they'll need to move. This means that once they get to where they would need to change chords, they start thinking about which finger goes where, which means that there will be a lag between the chord changes. Pick 2 guitar chords you can already play, since the exercise will have you moving between these chords. The exercise is great for your trouble chords as well. Strum the first chord 4 times, and keeping the rhythm of your strumming going, quickly move to the next chord, and play that chord 4 times. Put your fingers back into position and fret the 1st chord. Now change to the next chord as quick as you can, and just watch your fingers as they move. When your fingers come off of the fretboard, you'll probably have a couple of them hovering while you try to decide where each finger need to be placed. The reason this happens is because you haven't visualized where each finger needs to go before the chord change. Now, hold down the 1st chord again, then without actually changing to the 2nd chord, visualize the next chord shape. Visualize where each finger will go, one finger after the other, and how to do so most efficiently. By this, I mean don't lift any fingers unnecessarily, don't separate your fingers if you don't need to, and so on. Once you got the next chord shape in your mind, switch. 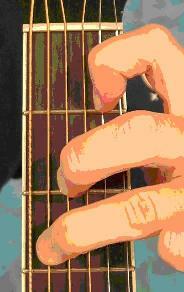 Do this as much as you need to, before your fingers start moving fluently between the chords. The key is to visualize. Remember to switch chords efficiently with the least amount of motion as possible. Don't bring your fingers far off the fretboard, since its a waist of time. Wow, 50 cords seems like a lot to learn, I think I’d have overload and it would ultimately slow me down. Inch by inch life’s a cinch. Hope you are doing great…! Firstly, I really thank & appreciate you from my bottom of heart for E-help/E-support. Secondly, I am striving to play chords but not able to play frequently with the beats(1st case) also facing less energy with the ring finger(2nd case) compare to other fingers while I try to play chords. So, please guide me how to improve these two cases. Would be highly obliged for the prompt suggestion/guiding. 1. Start doing finger exercises across the fretboard, and use a metronome while doing this. This will strengthen your fingers, improve their coordination, and improve you sense of rhythm as well. 2. You probably heard this a lot, but the more you practice, the better you get. It doesn’t happen overnight though, you need to play every day, and that’s how you see constant improvement. 3. Play songs based around chords, to get your fingers used to forming those chord shapes and changing in between them. It’s still really hard to get used to. Just like ProFuzz said: practice a lot! I remember the way I learned to switch quickly the chords from one to another!